These two paradigms have been supported for a very long time and therefore we will just look at them at a very high level. EF Core mainly targets the code-first approach and has limited support for the database-first approach, as there is no support for the visual designer or wizard for the database model out of the box. However, there are third-party tools and extensions that support this. The list of third-party tools and extensions can be seen at https://docs.microsoft.com/en-us/ef/core/extensions/. 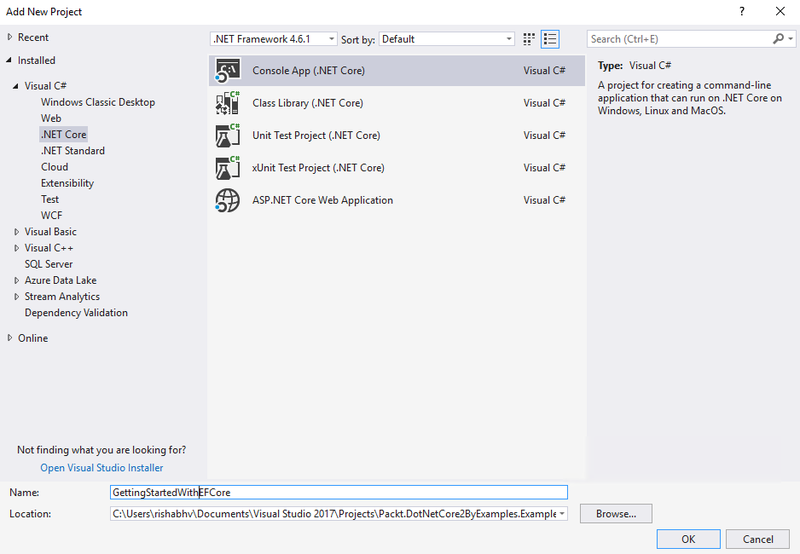 This tutorial has been extracted from the book .NET Core 2.0 By Example, by Rishabh Verma and Neha Shrivastava. Create a new folder named Models in the project node and add the Person class to this newly created folder. This will be our model entity class, which we will use for CRUD operations. The Context class derives from DbContext, which resides in the Microsoft.EntityFrameworkCore namespace. DbContext is an integral part of EF Core and if you have worked with EF, you will already be aware of it. An instance of DbContext represents a session with the database and can be used to query and save instances of your entities. DbContext is a combination of the Unit Of Work and Repository Patterns. 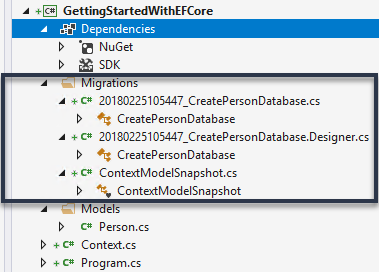 Typically, you create a class that derives from DbContext and contains Microsoft.EntityFrameworkCore.DbSet properties for each entity in the model. If properties have a public setter, they are automatically initialized when the instance of the derived context is created. It contains a property named Persons (plural of the model class Person) of type DbSet. This will map to the Persons table in the underlying database. The class overrides the OnConfiguring method of DbContext and specifies the connection string to be used with the SQL Server database. The connection string should be read from the configuration file, appSettings.json, but for the sake of brevity and simplicity, it’s hardcoded in the preceding code. The OnConfiguring method allows us to select and configure the data source to be used with a context using DbContextOptionsBuilder. Let’s look at the connection string. Server= specifies the server. It can be .\SQLEXPRESS, .\SQLSERVER, .\LOCALDB, or any other instance name based on the installation you have done. Database= specifies the database name that will be created. Trusted_Connection=True specifies that we are using integrated security or Windows authentication. An enthusiastic reader should read the official Microsoft Entity framework documentation on configuring the context at https://docs.microsoft.com/en-us/ef/core/miscellaneous/configuring-dbcontext. 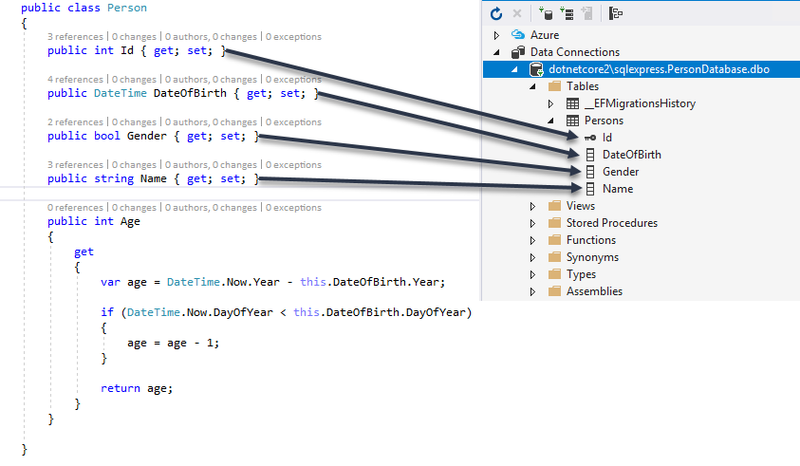 EF Core creates database tables for all DbSet properties in a Context class with the same name as that of the property. In the preceding example, the table name would be Persons based on this convention. 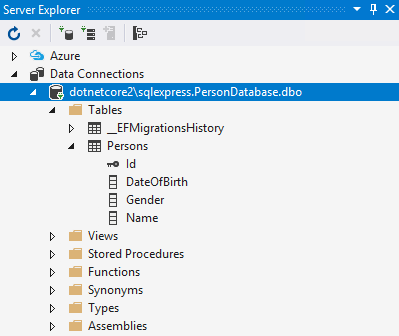 EF Core creates tables for entities that are not included as DbSet properties but are reachable through reference properties in the other DbSet entities. If the Person class had a complex/navigation property, EF Core would have created a table for it as well. EF Core creates columns for all the scalar read-write properties of a class with the same name as the property by default. It uses the reference and collection properties for building relationships among corresponding tables in the database. In the preceding example, the scalar properties of Person correspond to a column in the Persons table. EF Core assumes a property named ID or one that is suffixed with ID as a primary key. If the property is an integer type or Guid type, then EF Core also assumes it to be IDENTITY and automatically assigns a value when inserting the data. This is precisely what we will make use of in our example while inserting or creating a new Person. There are many other conventions, and we can define custom conventions as well. For more details, please read the official Microsoft documentation at https://docs.microsoft.com/en-us/ef/core/modeling/. Attributes: Conventions are often not enough to map the class to database objects. In such scenarios, we can use attributes called data annotation attributes to get the desired results. The [Required] attribute that we have just seen is an example of a data annotation attribute. Fluent API: This is the most powerful way of configuring the model and can be used in addition to or in place of attributes. The code written in the OnModelConfiguring method is an example of a Fluent API statement. Your startup project 'GettingStartedWithEFCore' doesn't reference Microsoft.EntityFrameworkCore.Design. 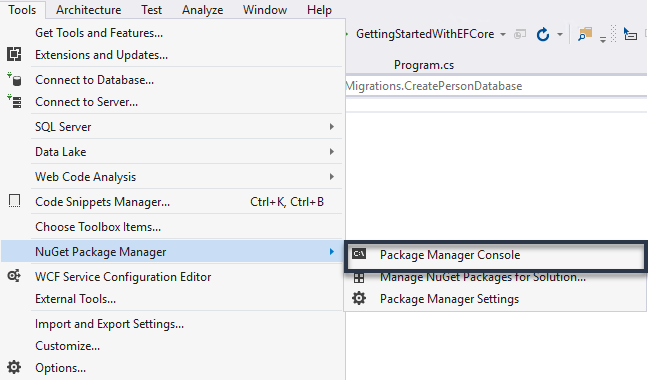 This package is required for the Entity Framework Core Tools to work. Ensure your startup project is correct, install the package, and try again. 8. Although we have migrations applied, we have still not created a database. To create the database, we need to run the following commands. If all goes well, we should have the database created with the Persons table (property of type DbSet) in the database. 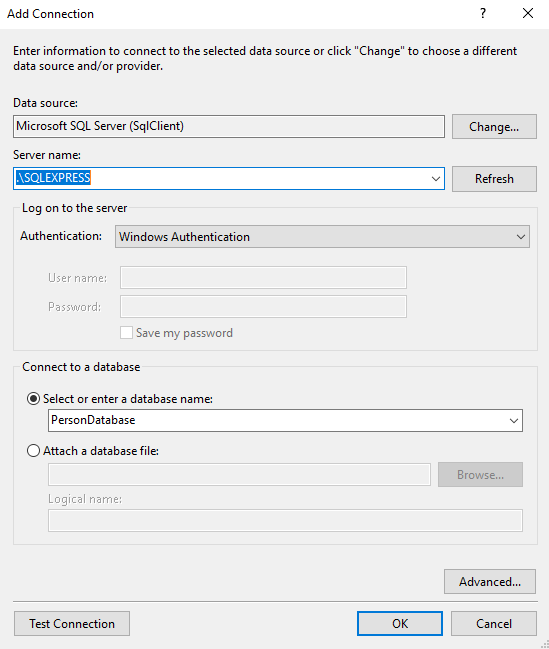 Let’s validate the table and database by using SQL Server Management Studio (SSMS). 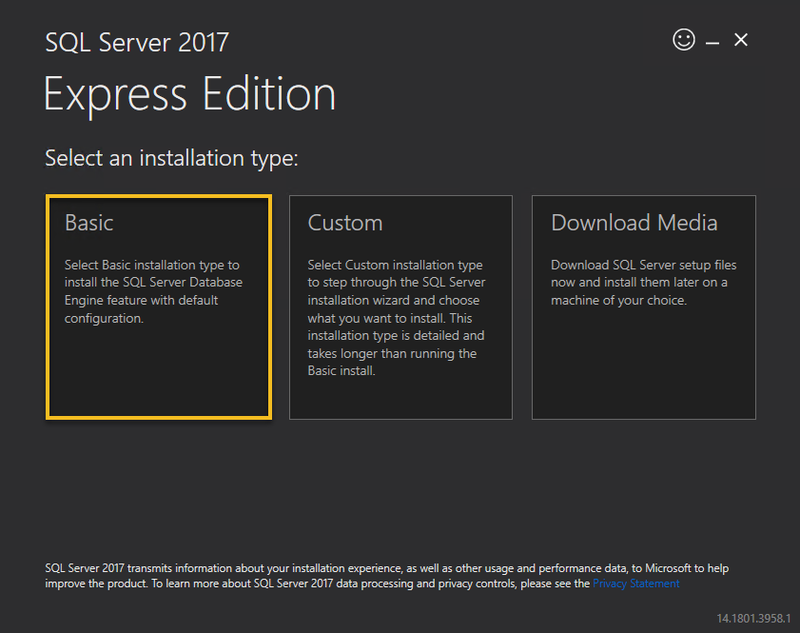 If SSMS is not installed in your machine, you can also use Visual Studio 2017 to view the database and table. Now, we will use the Context class to perform CRUD operations. //// Lets create an instance of Person class. Female. Prefer enum in real cases. which referes to Persons table. perform CRUD among many others. //// Use AddRange to add multiple persons in once. the Persons property below in Visual Studio IDE. now hold the id of created person. i.e. details of Rishabh Verma. //// Update the person in context. //// DELETE the person object. With this, we have completed our sample app to get started with EF Core. I hope this simple example will set you up to start using EF Core with confidence and encourage you to start exploring it further. The detailed features of EF Core can be learned from the official Microsoft documentation available at https://docs.microsoft.com/en-us/ef/core/. If you’re interested in learning more, head over to this book, .NET Core 2.0 By Example, by Rishabh Verma and Neha Shrivastava.